Spring is here! The freshness of this season almost begs us to shed our winter skin and revive the natural lightness of our body. The best way to cleanse and refresh is through our plate. So let’s talk about some seasonal vegetables which are natural diuretics and highly detoxifying! Green asparagus, in particular, is rich in antioxidants and has an incredible detox effect on the body. Spring is undoubtedly the best season for fresh asparagus. If it’s very thin, you can eat it raw (and thus enjoy all its vitamin C), or simply use a steamer to retain the maximum amount of antioxidants. Don’t hesitate to add it to your morning fresh fruit and veggie boosts to refuel all its nutrients. 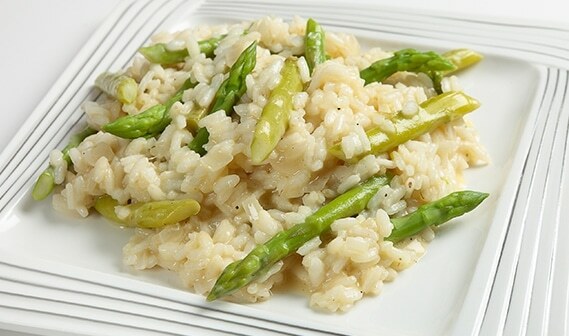 Personally, I love my asparagus thin, raw, and crunchy with a drizzle of olive oil and some freshly ground pepper, or lightly sautéed in a bit of olive oil and mixed with some wild rice or buckwheat. If asparagus is the Spring detox queen, then artichoke is king, because it contains 3 times more antioxidants than asparagus! 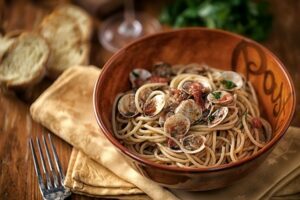 If you don’t typically reach for artichokes at your local fruit/veggie market, make this month your time to try some Fiesole baby purple artichokes or the more common globe artichoke. 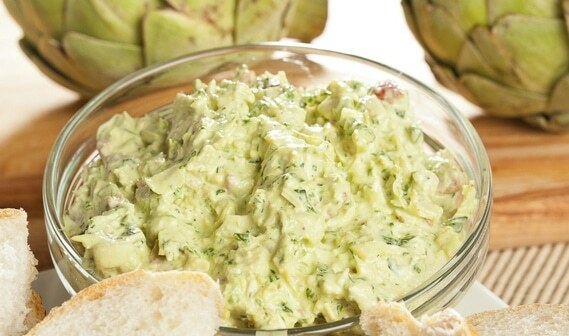 Note: Because this vegetable actually releases toxins when exposed to air and light, and can thus become toxic, if you are not eating your cooked artichoke immediately, keep it covered and refrigerated for no longer than 12 hours. 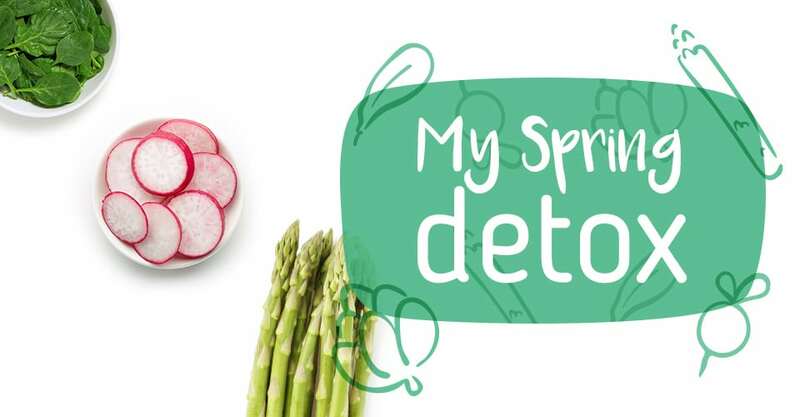 Pink, red or black, this vegetable is a spring star and truly refuels your body’s energy. The less commonly used black radish supports liver and gallbladder functions, leaving your body cleansed and toxin-free. This season, add radishes to your soups, fresh salads, and breakfast omelets. 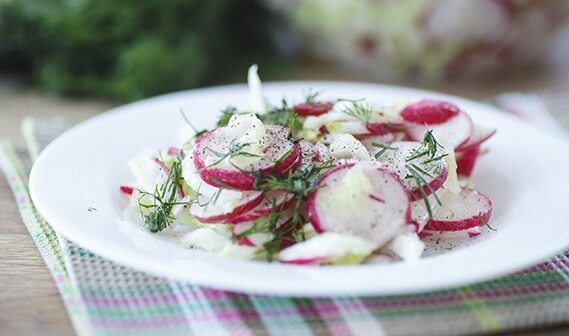 Radishes make for a perfect appetizer: light, healthy, and crunchy! 1. Wash and slice the radishes. 2. Chop the onion and mix it with the radish and fresh dill. 3. Drizzle a little hazelnut oil and season with salt and pink peppercorns. 4. Toss and serve right away! 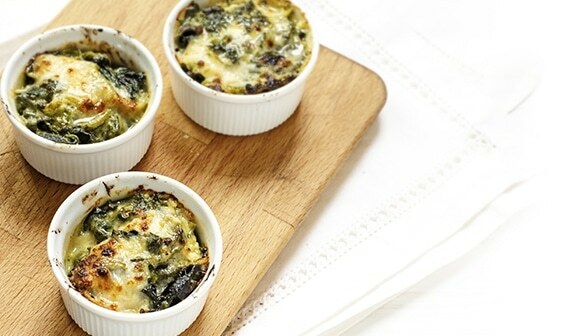 Spinach is an absolute powerhouse of nutrients. Rich in antioxidants and easy to add to your daily meals, this veggie will have you detoxed in no time! Spinach is very versatile and can be enjoyed raw or cooked – in smoothies, salads, soups, and as accompaniments to your main dishes. The next few months are prime time to enjoy the benefits of these superfoods. So head out to your local farmer’s market this Spring and let’s lighten up!